One of the five greatest SHINTO smiths was HIZEN TADAYOSHI. 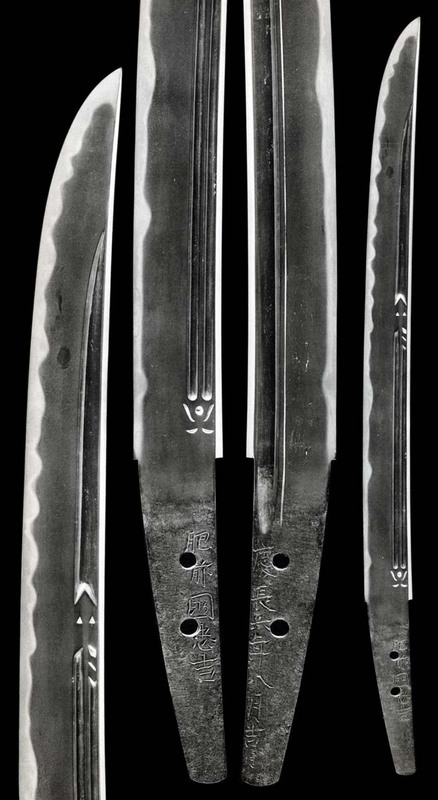 SHINTO SUGATA, strong-grain gray steel, CHU-SUGUHA in NIE, and �HIZEN NAKAGO. blue-gray to light gray-blackish steel. Thin skinned. Dark core-patches may be seen. HIRO or CHU-SUGUHA is a school mark. SUNAGASHI and ASHI. KINSUJI and INAZUMA. BOSHI - SUGU with MARU KAERI. An even width of YAKIBA. TOGARI and medium turnback. Some HAKIKAKE. NAKAGO - Long, with a graceful appearance. Both HAMON and JI-HADA will be uniform and well-executed. HASHIMOTO SHINZAEMON. SAGA JU NAGASE School. Under NABESHIMA NAOSHIGE, DAIMYO of HIZEN. work at the Castle in SAGA. He received MUSASHI DAIJO in GENWA JUNEN, 1624. 1632, 8TH month, 15th day, age, 61.
and can be mistaken for such old style works. perfection and grace in the conservative SUGUHA. upper. Simple signatures will tend to be early. KO-NIE DEKI GUNOME CHOJI-MIDARE BA. Classic example of Tadayoshi Sugata. Ko-Itame and Chu-Suguha. Shinogi-Tsukuri, Ihori-Mune, shallow Sori broad elongated Chu-Kissaki. 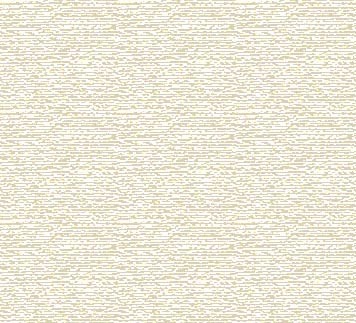 A perfect carpet of Ko-Itame with Mokume Hada has Ji-Nie and Chikei. Gentle Asaki-Notare Chu-Suguha hides Ko-Gunome of Ko-Ashi with Kinsuji and Sunagashi. Ubu Kurijiri Nakago with one Mekugi-ana. 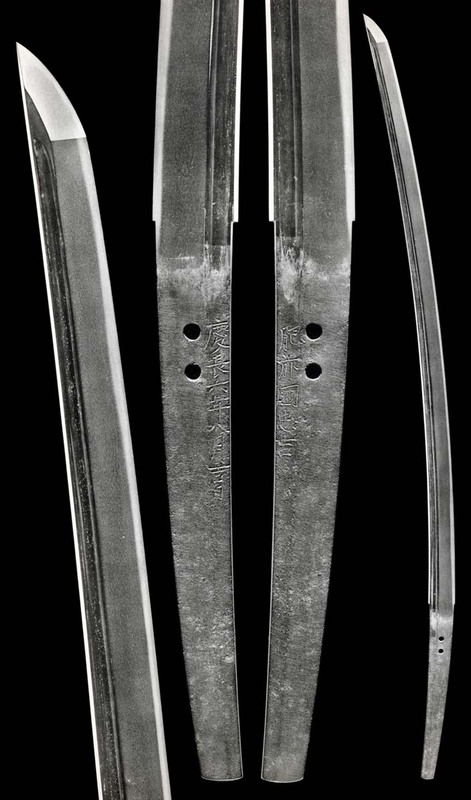 Shinogi-Tsukuri, Ihori-Mune, deeply curved, wide Ji, elongated Chu-Kissaki. Ko-Itame Hada with Masame along the Ha. There is Ji-Nie and some Chikei. Hoso-Suguha that becomes Nijuba and KuichigaiBa is seen. Ko-Nie, Hakikake and Ko-Ashi. Sugu Ko-Maru Omote Boshi, Ura is O-maru..
Ubu Nakago with shallow Kurijiri has two Mekugi-ana. Omote: ToHi Hata Flag on Futatsu Hi with Rendai. Upper: Rippling N Otare of Ko-Gunome Togari Ba with Tobi-Yaki. 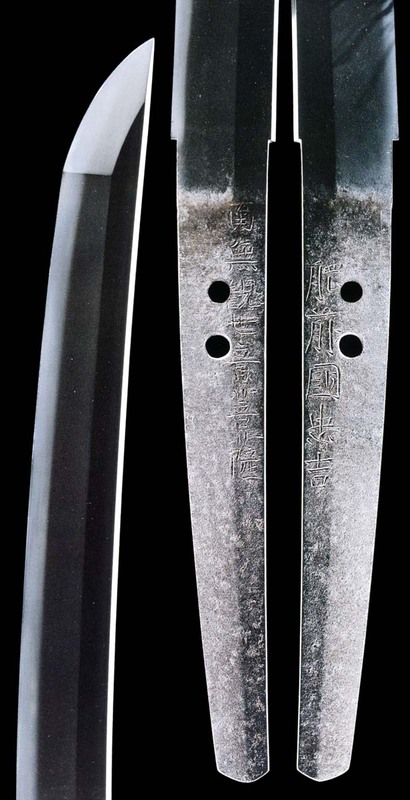 Lower: Asaki-Notare with Ko-Gunome. In tight Nioi and Kinsuji. Midare-Komi Boshi with Maru Kaeri. Ubu Kurijiri Nakago with two Mekugi-ana. 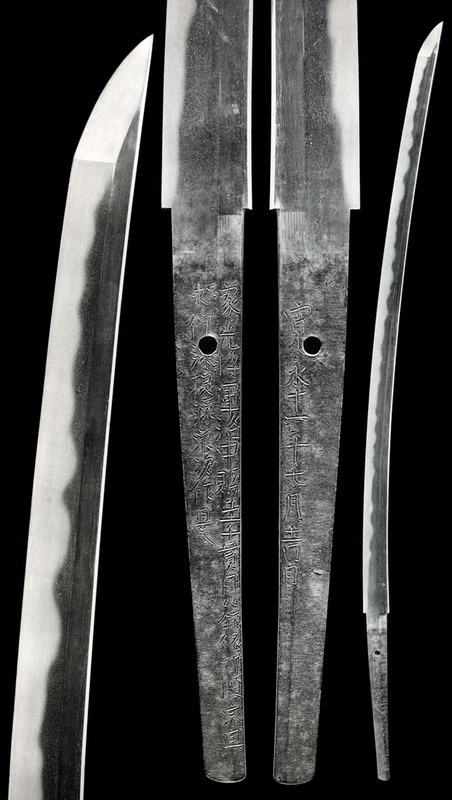 Shinogi-Tsukuri, Ihori-Mune, shallow Sori, elongated Chu-Kissaki. Ko-Itame with Mokume mixed has Ji-Nie and Chikei. Asaki-Notare of Chu-Suguha holds Ko-Gunome Ko-Ashi with Kinsuji and Sunagashi. Ko-Itame Hada with Ji-Nie and Chikei. Chu-Suguha in even Nioi and Ko-Nie. Standing Ko-Itame with Ko-Mokume Hada has Ji-Nie and Chikei. Gunome Choji-Midare crowd together with long Ashi-iri in Ko-Nie and deep Nioi while Kinsuji and Sunagashi cut through. Small Tobi-Yaki hang in the Ji above. Sugu Ko-Maru Boshi with short Kaeri. Ubu Kengyo Nakago with one Mekugi-ana. Running Itame Hada has Ji-Nie. High-reaching Gunome Choji Midare Ba in clear Nie and Nie with Sunagashi and Kinsuji. Ubu Kurijiri Nakago has one Mekugi-ana. Omote: Bonji and Suken with Tsume Claw. Ura: Bonji, Gomabashi and Tsume Claw. Ko-Nie Ko-Notare of Ko-Gunome with Ashi-iri. Sunagashi and Kinsuji pierce the Habuchi of the mid creating Niju effects. Mune-Yaki of Sunagashi and Kinsuji touch along the back. Midare-Komi Saagari Maru Boshi has Hakikake. Ubu Kengyo Nakago has two Mekugi-ana. Chu-Suguha has Ko- Gunome with Ashi and Yo in Nioi-Fukashi and Ko-Nie. Sunagashi runs. Midare-Komi Boshi hasHotsure and Ko-Maru Kaeri. Ubu Kengyo Nakago has one Mekugi-ana. Shinogi-Tsukuri, Ihori-Mune, raised Shinogi-Taka to Chu-Kissaki. Ko-Itame Hada is tight and running. Thin Ji-Nie. Hiro-Suguha in a long and gentle Asaki-Notare. Hamon has Choji Ashi and long Sunagashi in the Habuchi. In Nioi-Fukashi and Ko-Nie. Chu-Sugu, Saagari Ko-Maru Boshi with medium turnback. Kengyo, Ubu Nakago has one Mekugi-ana. Tightly textured KO-ITAME HADA flows smoothly. The steel is clear, and grain lines, light. The YAKIBA is evenly bright in a moderately tight NIOI-GUCHI, which expands into HATARAKI that attends the CHU-SUGUHA HAMON. BOSHI is CHU-SUGU to CHU-MARU and a wide, medium fall and abrupt Kaeri. Shinogi-Tsukuri, Ihori-Mune, Shinogi-Taka to Chu-Kissaki. Tightly knit Ko-Itame Hada has Ji-Nie. Chu-Suguha in Nioi-Fukashi and Ko-Nie. Standing and knit Ko-Itame Hada becomes stronger Itame in the Moto. Ji-Nie and Chikei are seen. Suguha that is slightly Asaki-Notare holds Gunome with Ashi and Yo. Sunagashi and Kinsuji attend. Sugu Boshi has Ko-maru with Hakikake. 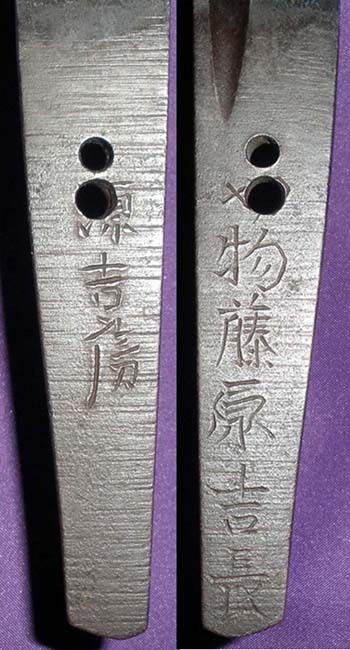 Ubu Kurijiri Nakago has two Mekugi-ana. Itame Hada Runs and stands. Masame in the ShinogiJi. Billowing Notare has Gunome-Midare with Choji Ashi and Gunome Ashi with many Yo. Strong Nie and running Sunagashi. O-Midare Komi Boshi has Sunagashi and Hotsure. IYO no JO first signed MASATSUGU, his father HATORI NO SUKE of SAKAI UCHI-KURO no SHO. SHINOGI-TSUKURI, IHORI-MUNE. 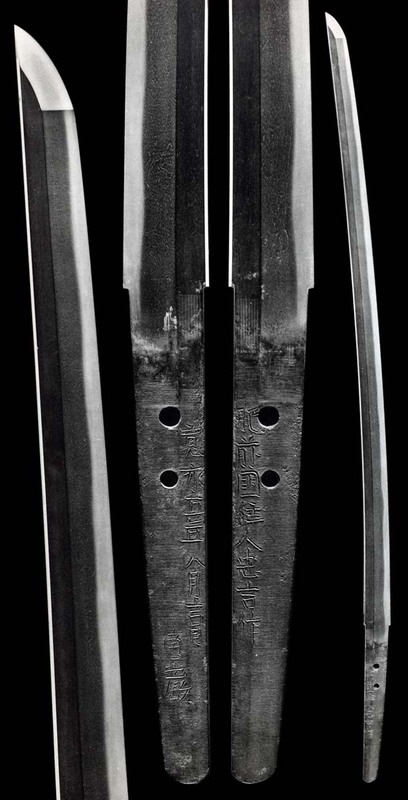 KO-ITAME HADA runs in dark steel. MASAME in the SHINOGI-JI. Lively KO-NIE paints a smooth-flowing KO-NOTARE BA of GUNOME-MIDARE BA has SUNAGASHI following the grain. There is a long NIJUBA extending in the MONOUCHI and bright KINSUJI and KO-NIE of different size run through the HAKIKAKE BOSHI. UBU, KURIJIRI with one MEKUGI-ANA. 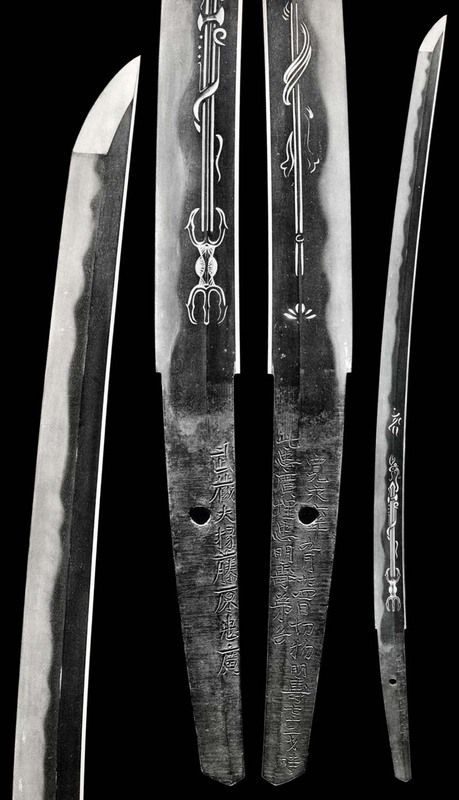 Shinogi-Tsukuri, Ihori-Mune, deep curve to Ikubi-Kissaki. Standing O-Mokume Hada. Dark steel of purple cast. Billowing Notare-Midare of clustering Choji with Ashi with many Yo. The mid becomes more active with strong Nie at the tops and running Sunagashi that pulls Nijuba through figures. Kaen Boshi in Ko-Nie and Hakikake. Shinogi-Tsukuri, Ihori-Mune, wide and strong to elongated Chu-Kissaki. Standing Itame Hada has Ji-Nie and Chikei. Mounding Ko-Gunome Togari and Ko-Choji Midare with falling Ashi in Nie and strongly running Sunagashi. Hotsure and small Tobi dot in the Ji. Midare-Komi Boshi is O-Maru with falling Kaeri on the Mune. Ko-Itame Konuka Hada has Ji-Nie. Notare in deep Nioi and Nie with Ashi. Yoshifusa and Yoshinaga were students of Shodai Tadayoshi. Both worked in the early Shinto prior to the Kanbun. Yoshinaga went to Kyoto with his father, Munenaga, where both father and son learned carving from Umetada Myoju. 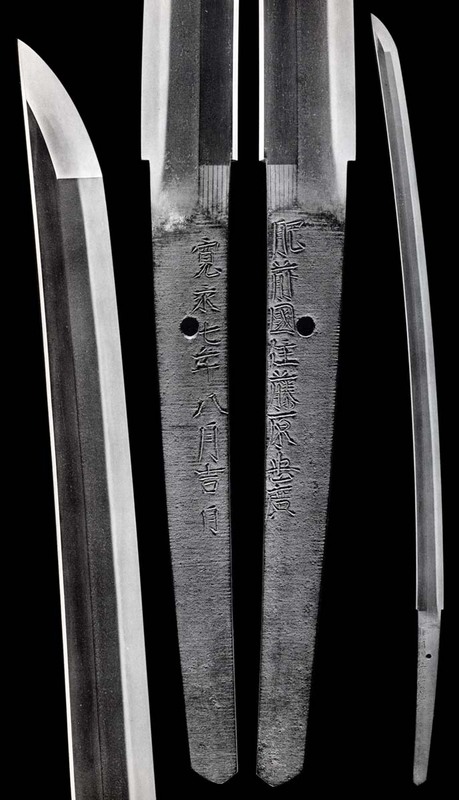 They are the top distinguished carvers in history and rank with Kotetsu and with such carvers as Shinshinto Yoshitane, brother of Naotane. Yoshinaga’s carving will be found on works of Shodai Tadayoshi, Nidai Tadahiro, Yoshifusa and Shodai Masahiro.